The Holy Equal-to-the-Apostles First-Teachers and Enlighteners of the Slavic Peoples, the Brothers Cyril and Methodius came from an illustrious and pious family living in the Greek city of Soluneia (Thessalonika). Saint Methodius was the oldest of seven brothers, Saint Contantine (Cyril – was his monastic name) was the youngest. Saint Methodius was at first in the military profession and was governor in one of the Slavic principalities dependent to the Byzantine empire – probably Bulgaria, which made it possible for him to learn the Slavic language. Having dwelt there for about 10 years, Saint Methodius afterwards accepted monastic orders at one of the monasteries on Mount Olympos (Asia Minor). Saint Constantine from his early years distinguished himself by great aptitude and he studied together with the emperor Michael during that one's youth – under the finest teachers in Constantinople, among which were Photios, future Patriarch of Constantinople. Saint Constantine, having attained knowledge in all the sciences of his time and also many languages, also with particular diligence studied the works of Sainted Gregory the Theologian. Because of his keen mind and penetrating perception, Saint Constantine received the title "Philosopher" (wise). Upon the completion of his education, Saint Constantine accepted the dignity of priest and was appointed curator of the patriarchal library at the church of Saint Sophia, but he soon quit the capital and went off secretly to a monastery. Discovered there and having returned to Constantinople, he was appointed teacher of philosophy in the highest level of the Constantinople schools. The wisdom and strength of faith for the still rather young Constantine was so great, that he won the victory in a debate with the leader of the heretic-iconclasts Ananias. After this victory Constantine was sent by the emperor to dispute in a debate about the Holy Trinity with the Saracens (musselmans) and again he gained the victory. Having returned, Saint Constantine went off to his brother Saint Methodius on Olympos, spending the time in unceasing prayer and reading the works of the holy fathers. The emperor soon summoned forth both of the holy brothers from the monastery and dispatched them to preach the Gospel to the Khazars. Along the way they stayed for some time in the city of Korsun, making preparations for preaching. There the holy brothers in miraculous manner discovered the relics of the Priestmartyr Clement, Pope of Rome (Comm. 25 November). There also at Korsun Saint Constantine found a Gospel and Psalter written in "Russian letters" [i.e. Slavonic], and a man speaking in Slavic, and he began to learn from this man to read and to speak in his language. After this, the holy brothers set off to the Khazars, where they gained the victory in a debate with Jews and Moslems by preaching the Gospel teaching. On the way home the brothers again visited Korsun and, taking up the relics of Saint Clement there, they returned to Constantinople. Saint Constantine remained in the capital, but Saint Methodius received the hegumenate at the small Polychronion monastery – not far from Mount Olympos, where he pursued asceticism as before. Soon there came to the emperor messengers from the Moravian prince Rostislav, otherwise pressured by German bishops – with a request to send teachers to Moravia, who would be able to preach in the vernacular Slavic tongue. The emperor summoned Saint Constantine and said to him: "It is necessary for thee to go thither, where it be better for thee that no one realise this". Saint Constantine prepared for the new task with fasting and prayer. With the help of his brother Saint Methodius and the students Gorazd, Clement, Savva, Naum and Angelyar he composed a Slavonic alphabet and translated into the Slavic tongue books – without which it would be impossible to celebrate Divine‑services: the Gospel, Epistles, Psalter and collected services. This occurred in the year 863. After completing the translation, the holy brothers set off to Moravia, where they were received with great honour, and they began to teach the Divine-services in the Slavic language. This aroused the malice of the German bishops, who celebrated Divine-services in the Moravian churches in the Latin language, and they rose up against the holy brothers, convinced that Divine-services must be done only in one of three languages: Hebrew, Greek or Latin. Saint Constantine answered them: "Ye recognise only three languages by which to give glory to God. But David sang: Come to the Lord, all nations, praise the Lord all peoples, let everything that hath breath praise the Lord! And in the Holy Gospel it says: Go teach all nations...". The German bishops were humiliated, but they became all the more bitter and sent off a complaint to Rome. The holy brothers were summoned to Rome for a decision on this question. Taking with them the relics of Saint Clement Pope of Rome, Saints Constantine and Methodius set off to Rome. Knowing that the holy brothers were bringing along with them these relics, Pope Adrian met them along the way with his clergy. The holy brothers were greeted with honour, the pope of Rome gave permission for Divine-services in the Slavonic language, and the books translated by the brothers he ordered to be placed in Roman churches and to make liturgy in the Slavonic language. At Rome Saint Constantine fell ill and, in a miraculous vision from the Lord advising of the nearness of death, he accepted the monastic schema-order with the name of Cyril (Kirill). 50 days after the accepting of the schema, on 14 February 869, Saint Cyril died at 42 years of age. 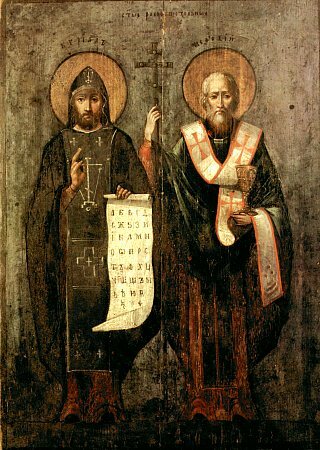 In expiring to God, Saint Cyril commanded his brother Saint Methodius to continue with their common task – the enlightening of the Slavic peoples with the light of the true faith. Saint Methodius entreated the pope of Rome to send the body of his brother for burial in their native land, but the pope commanded the relics of Saint Cyril to be placed in the church of Saint Clement, where miracles began to occur from them. After the death of Saint Cyril, the pope in fulfilling the request of the Slavic prince Kotsel, sent Saint Methodius to Pannonia, – having ordained him Archbishop of Moravia and Pannonia, on the ancient throne of the holy Disciple Andronikes. In Pannonia Saint Methodius together with his students continued to propagate Divine-services in books inscribed in the Slavonic language. This again aroused the wrath of the German bishops. They obtained an arrest and held a trial over Saint Methodius, who was sent in chains to Swabia, where during the course of two and an half years he underwent many sufferings. Having been set free by order of the Pope of Rome, John VIII, and restored to the rule of his archdiocese, Saint Methodius continued to preach the Gospel among the Slavs. He baptised the Czech prince Borivoi and his spouse Liudmila (Comm. 16 September), and also one of the Polish princes. The German bishops started a persecution against the saint for a third time, – for not accepting the Roman teaching about the procession of the Holy Spirit from both the Father and from the Son. Saint Methodius was summoned to Rome, but he justified himself before the pope, and preserved in its purity the Orthodox teaching, and was sent off again to the capital of Moravia, Velehrad. Here in the ensuing years of his life Saint Methodius with the help of two of his priest-students translated into the Slavonic language all the Old Testament except for the Book of Maccabbees, and even the Nomokanon (Rule of the holy fathers) and books of the holy fathers (Paterikon). Sensing the nearness of death, Saint Methodius decreed one of his students – Gorazd, as worthy successor to himself. The sainted-bishop predicted the day of his death and he died on 6 April 885 at an age of about 60 years. The burial service of the saint was done in three languages – Slavonic, Greek and Latin. He was buried in the cathedral church of Velehrad.